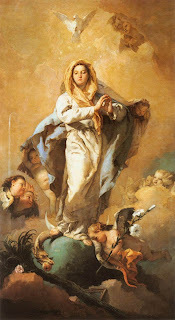 It might be said of Venetian painter Giovanni Battista Tiepolo (1696-1770) that he is one of the last great painters of sacred art who painted in the baroque tradition (when he died, in Spain, he was swimming against the neo-classical current). Tiepolo is a master who added his own developments to the form of the baroque as it developed in the 17th century, but without compromising on the principles of the tradition. This makes him worthy of attention today, I feel. The mark of a living tradition is that it able to reapply its principles without compromising on those aspects that define it; when it does this it always speaks to and of its time. This is different from pastiche, which is a rigid copying of style. (Although frankly I think pastiche is underrated – I’d take decent pastiche of the 17th century baroque over modernism every time.) Incidentally, another possible area to study to this end is that of landscape painting. I would maintain that the baroque principles of landscape painting, unlike its sacred form did not decline in the 18th century, but continued to develop well into the 19th century. Nineteenth century landscape is, in my opinion, even better than its 17th century counterpart. There are lessons to be learnt that could be taken from the mundane form and applied to the sacred art. Because landscape is not sacred art, I will not write about it for the New Liturgical Movement but for those who are interested I have begun to post a series of articles about this on my blog, here. All these accessories are not absolutely and rigidly required and the 17th century Spanish artist, Murillo, who is perhaps the painter most known for the Conception, strayed from Pacheco without being considered the less orthodox for it. His moon, for example, is sometimes full, or when a crescent, the horns point upwards instead of downwards (as we see in Tiepolo’s). 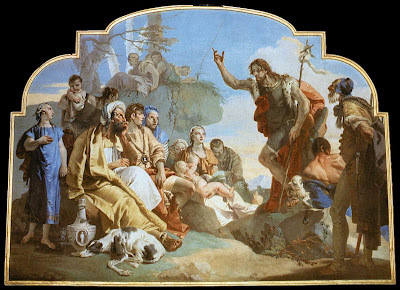 In this example, Tiepolo varies the focus and where he mutes the colour he uses tonal variation to describe form, in characteristic baroque mode. I have written more about this in articles here and here. Look, for example, at the mantle. This is intended to be seen in our mind’s eye as uniformly blue in accordance with Pacheco’s specifications. However, only part of it in his painting of it is actually blue. 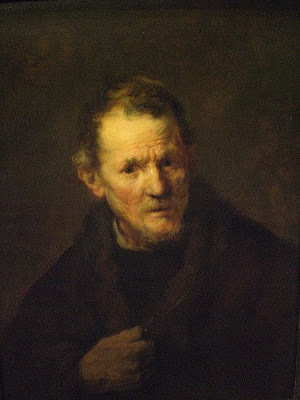 Much is rendered tonally in brown ochre and sepia.